Lady Death will tear your heart out this Valentine’s Day! Valentine’s Day is Tuesday, February 14. 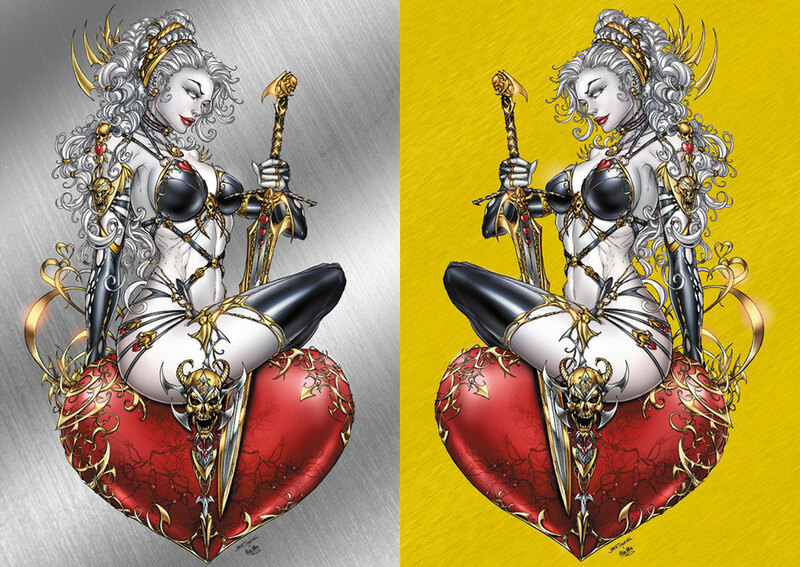 Starting this Friday, you’ll never be alone again when you pick up one of these very special (and very limited) new Lady Death Valentine’s Day editions featuring brand new art by Jamie Tyndall and Ula Mos! These editions will be available exclusively at Lady Death Store. Nothing says “I LOVE YOU” more than the QUEEN OF HELL, Lady Death! Mark your calendars: preorders for these editions will begin on Friday, February 10 at 9:00AM MST (Arizona Time) at Lady Death Store. Collect them all! Full color, 24 pages. Limited to 99 serially numbered copies. Full color, 24 pages. Cover enhanced with real Swarovski crystals! Limited to 99 serially numbered copies. Full color, 24 pages. Premium pearl linen cover! Limited to just 50 serially numbered copies! Full color, 24 pages. METAL front cover limited to just 33 serially numbered copies! Solid metal collectible trading card! Production run alternates between silver (odd-numbered) and gold (even-numbered) cards for a combined total of 99 serially numbered cards. Full color 11×17″ printed on premium glossy stock. Starting on Friday, February 10 at 9:00AM MST (Arizona), we’re also offering items based on Mike DeBalfo’s Valentine’s Day artwork once again! Quantities will be limited! Solid metal collectible trading card! Limited to 99 serially numbered cards. NOTE: Available quantities are limited! Get it while supplies last! IMPORTANT NOTE ON AVAILABILITY: We expect to ship all products listed in this solicitation beginning Wednesday, February 15.